The Blasket Islands (Na Blascaodaí in Irish - etymology uncertain: it may come from the Norse word "brasker", meaning "a dangerous place") are a group of islands off the west coast of Ireland, forming part of County Kerry. They were inhabited until 1953 by a completely Irish-speaking population, and today are part of the Gaeltacht. The inhabitants were forcefully evacuated by the government to the mainland on 17 November 1953.[why?] Many[quantify] of the descendants currently[when?] live in Springfield, Massachusetts,[not in citation given] and some former residents still live on the Dingle Peninsula, within sight of their former home. The Cliffs of Moher (Irish: Aillte an Mhothair) are located at the southwestern edge of the Burren region in County Clare, Ireland. They rise 120 metres (390 ft) above the Atlantic Ocean at Hag's Head, and reach their maximum height of 214 metres (702 ft) just north of O'Brien's Tower, eight kilometres to the north. A round stone tower near the midpoint of the cliffs, the tower was built in 1835 by Sir Cornelius O'Brien. From the cliffs and from atop the tower, visitors can see the Aran Islands in Galway Bay, the Maumturks and Twelve Pins mountain ranges to the north in County Galway, and Loop Head to the south. 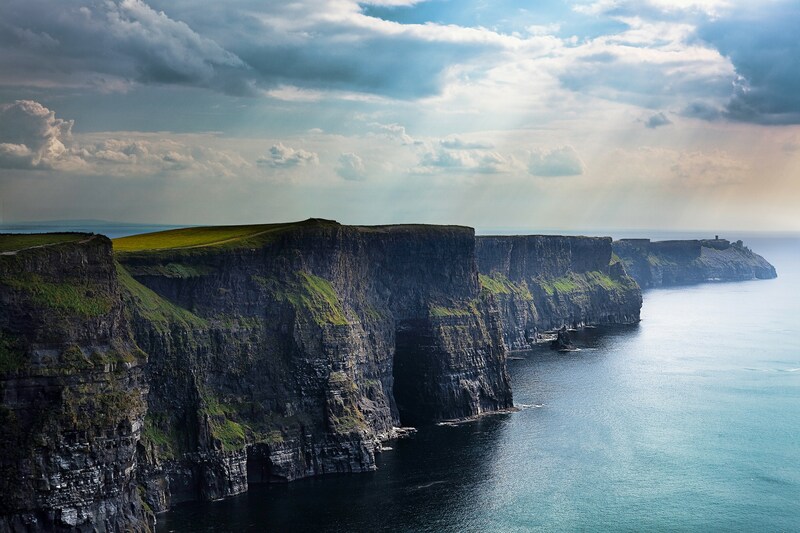 The cliffs rank amongst the top visited tourist sites in Ireland, and receive almost one million visitors a year. The closest settlements are Liscannor (6 km south) and Doolin (7 km north). 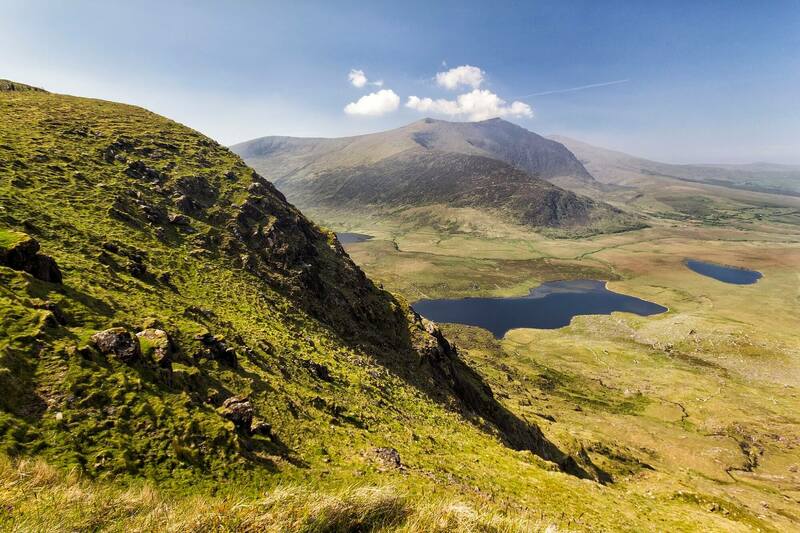 Kerry is the fifth-largest of the 32 counties of Ireland by area and the 15th-largest by population. It is the second-largest of Munster's six counties by area, and the fourth-largest by population. Uniquely, it is bordered by only two other counties: County Limerick to the east and County Cork to the south-east. The county town is Tralee. The diocesan see is Killarney, which is one of Ireland's most famous tourist destinations. The Lakes of Killarney, an area of outstanding natural beauty are located in Killarney National Park. 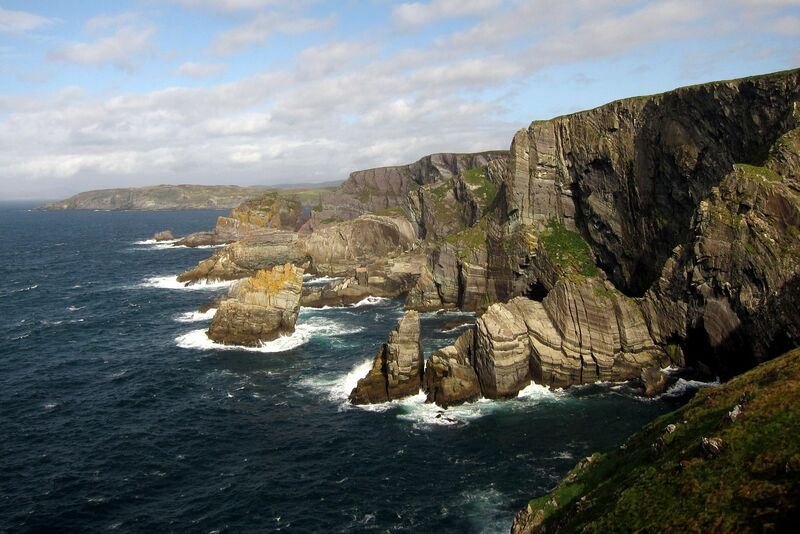 The tip of the Dingle Peninsula is the most westerly point of Ireland. Glendalough Upper Lake (Irish: An Loch Uachtair) is a glacial lake near Glendalough, County Wicklow, Ireland. 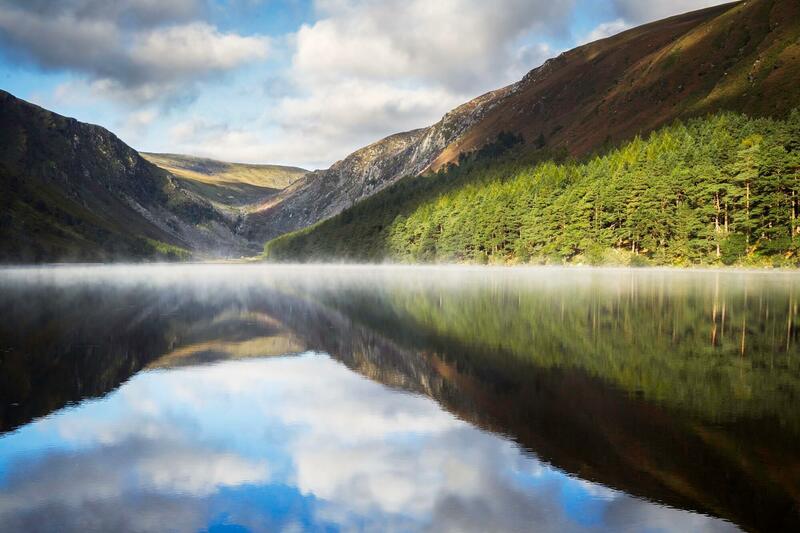 The lake is located in the Wicklow Mountains area west of Glendalough Early Medieval monastic settlement. Near the southern shore stands a small rectangular church named Temple-na-Skellig, only accessible by boat and a series of steps from the landing stage; a nearby cliff hosts a cave called St. Kevin's bed, reputedly a retreat for St. Kevin and later for St. Laurence O'Toole. The lake is classified as a ribbon lake. The Upper and the Lower lake were at first united but one of their inflow brought an amount of sediment large enough to divide the original lake in two parts. Mizen Head (Irish: Carn Uí Néid), is located at the extremity of a peninsula in the district of Carbery in County Cork, Ireland. It is one of the extreme points of the island of Ireland and is a major tourist attraction, noted for its dramatic cliff scenery. One of the main transatlantic shipping routes passes close by to the south, and Mizen Head was, for many seafarers, the first (or last) sight of Europe. The tip of the peninsula is almost an island, cut off by a deep chasm, now spanned by a bridge; this gives access to an old signal station, a weather station, and a lighthouse. The signal station, once permanently manned, is now a museum housing displays relating to the site's strategic significance for transatlantic shipping and communications, including the pioneering efforts of Guglielmo Marconi. The "99 steps" which formed part of the original access route have been supplemented by a series of paths and viewing platforms, and a full range of visitor facilities is available at the entrance to the site. The villages of Ballydehob, Crookhaven, Goleen, and Schull are located on the peninsula to the east. Contrary to popular belief, Mizen Head is not the most southerly point on the mainland of Ireland; nearby Brow Head holds that title. Nevertheless, geography books have long measured the length of Ireland "from Fair Head to Mizen Head" or "from Malin Head to Mizen Head. Skellig Michael (Irish: Sceilig Mhichíl) (or the Great Skellig (Irish: Sceilig Mhór) is a twin-pinnacled crag situated 11.6 kilometres (7.2 mi) west of the Iveragh Peninsula in County Kerry, Ireland. 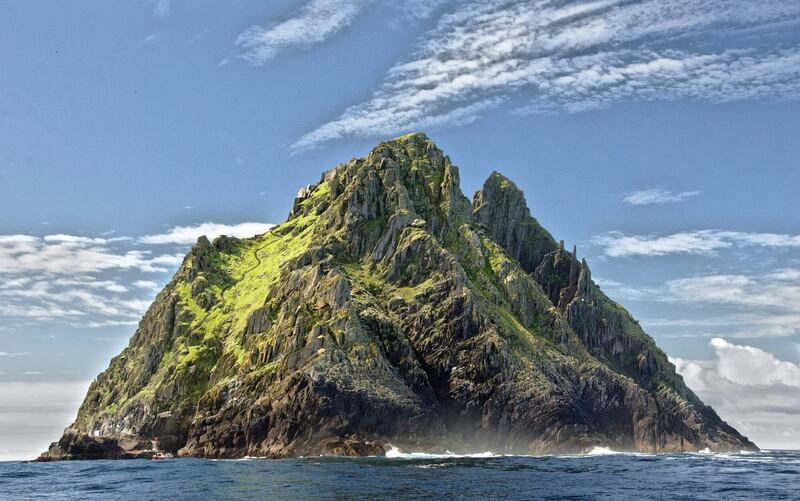 Its twin island, "Little Skellig" (Sceilig Bheag) is smaller and practically inaccessible, and is closed to the public. The Skellig Islands, along with some of the Blasket Islands, form the most westerly part of the Republic of Ireland. Skellig Michael consists of approximately 44 acres of rock, with its highest point, the Spit, 714 feet above sea level. It is known for its steep inhospitable landscape, the Gaelic monastery founded between the 6th and 8th century, and its variety of inhabiting species, including gannets, puffins, a colony of razorbills and a resident population of approximately fifty grey seals. The rock contains the remains of a tower house, a megalithic stone row and a cross inscribed slab known as the "Wailing Woman". The monastery is situated at 550–600 feet, while "Christ's Saddle" is 422 feet and the flagstaff area is 120 feet above sea level. The island's slopes are ascended by a flight of stone steps. The remains of the monastery, which today consists of a small enclosure of beehive huts and oratories, and most of the island, became a UNESCO World Heritage Site in 1996. Because of the often difficult crossing from the mainland and the exposed nature of the small landing spot, the island is only accessible to the public during the summer months.